I don't know about you, but I like prototypes. Maybe too much. I'd prototype myself if I could. But I find it increasingly hard to get small projects off the ground... compile ruby, update rubygems, something is broken, download node, compile node, npm grunt, write a list of dependencies, what was I trying to do again? Sounds familiar? There must be a better way! Well, there is. 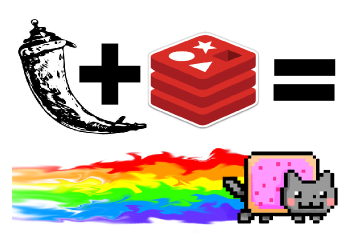 Redis (http://redis.io/topics/introduction) is an in-memory key-value cache and store. It can contain strings, hashes, lists, sets, order sets, and hyperlogslogs. It also has many extra components that can make an application really powerful: pub-sub, keys with limited time-to-live, master-slave data replication, and much more. Some things I really like about it is atomic operations, really handy where many clients interact with the same data, and powerful querying (ranking, counters) on keys. And since it runs in RAM its blazingly fast! Sure, you say, SQL does all that and more. Sure, I say, but Redis is very light weight and really easy to use. Moreover, since I used it first it has only become more robust and powerful. In comparison to other mega frameworks (Django) and smaller frameworks that try to re-invent the wheel (Bottle), Flask is a straightforward, no-bs framework. Plus, I have not had this much fun using a framework since I first used Sinatra many years ago. Really? I'm done setting up? Yup. I want to create a single entry point that allows me to create a resource when issuing a PUT request. I want this resource to not serve (error) GET requests unless previously created. And I want resources to be cleared after a year. We will now write the prototype app, in one method, like a boss. Redis (through redis-py, which is what we are using https://redis-py.readthedocs.org/en/latest/) has a powerful hash API http://redis.io/commands#hash that will suffice all our needs. if not db.exists(path): #does the hash exist? And its unit tests. Coming from Rails I wrote these guys first, but forefront tests don't make good posts. Will be included in the upcoming (#48) Redis Watch newsletter – Itamar. Aw, shucks. Already did it – https://github.com/itamarhaber/flask-redis-microservice (and it is also a Heroku Button ;)) – shall I submit you with a PR? Awesome! Sure. I’ll merge and both repos can be on the same HEAD. Thanks! I’ll put your name/link up in the post. Cool, a basic Redis example. I was having doubts about using a flask extension or pure python Redis client. I think will go with pure python client now.